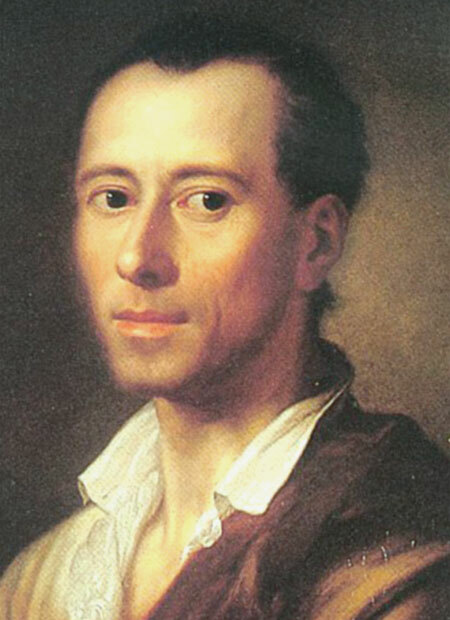 JOHANN JOACHIM WINCKELMANN German art historian and archaeologist, born (d: 1768); Winckelmann was a pioneering Hellenist who first articulated the difference between Greek, Greco-Roman and Roman art. “The prophet and founding hero of modern archaeology,” Winckelmann was one of the founders of scientific archaeology and first applied the categories of style on a large, systematic basis to the history of art. Many consider him the father of the discipline of art history. His would be the decisive influence on the rise of the neoclassical movement during the late eighteenth century. With the intention of becoming a physician, in 1740 Winckelmann attended medical classes at Jena. He also worked teaching languages. From 1743 to 1748, he was the deputy headmaster of the gymnasium of Seehausen in the Altmark. Winckelmann felt that work with children was not his true calling. Moreover, his means were insufficient: his salary was so low that he had to rely on his students’ parents for free meals. He was thus obliged to accept a tutorship near Magdeburg. While tutor for the powerful Lamprecht family, he fell into unrequited love with the handsome Lamprecht son. This was one of a series of such loves throughout his life. His enthusiasm for the male form excited Winckelmann’s budding admiration of ancient Greek and Roman sculpture. Originally, Winckelmann planned to stay in Italy only two years with the help of the grant from Dresden, but the outbreak of the Seven Years War (1756-1763) changed his plans. He was named librarian to Cardinal Passionei, who was impressed by Winckelmann’s beautiful Greek writing. Winckelmann also became librarian to Cardinal Archinto, and received much kindness from Cardinal Passionei. After their deaths, Winckelmann was hired as librarian in the house of Alessandro Cardinal Albani, who was forming his magnificent collection of antiquities in the villa at Porta Salaria.